Getting a cab when you are in a commercial area is usually not a problem. They are plentiful. They are not easy to get in a residential area. You have to call. This applies to Mexicans and visitors alike. 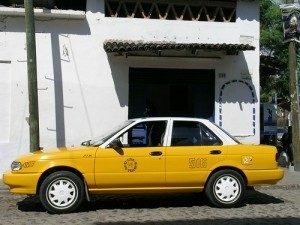 Uber is now encroaching on the taxi business here in PV. Uber is simple to use. Mexicans and visitors use Uber now. The cab drivers are angry, Uber is taking their business. I don’t think getting angry is going to fix it. I think they need to compete. I think an app that is similar to Uber’s, maybe not as sophisticated, is something they might need. Maybe it could be something as simple as WhatsApp. You don’t know how much the fare will be. You don’t know when and if your cab is coming. Send a message to one WhatsApp phone number for all of PV. You message the number via WhatsApp and get an immeddiate response with details. How much the fare will be, when your cab will arrive, taxi #, etc.. I order my gas (propane) this way. It is simple and there are no communication issues. Sign up for an account, no credit card. Your name, phone number, email address. Order a taxi – fill out a form with your location, your destination, etc..
Dispatcher locates a cab for you (via radio) and confirms your cab is on the way via the app. Driver radios to dispatch that he has picked up the customer and the dispatcher closes the trip in the app. I don’t know if either WhatsApp or a taxi app is something the taxi drivers would be interested in, but I know that Uber is not going away and the taxi drivers will lose business if they don’t evolve.